I visited Canada the week of January 21, 2013, during their coldest weather in eight years, and I was thrilled to be there. 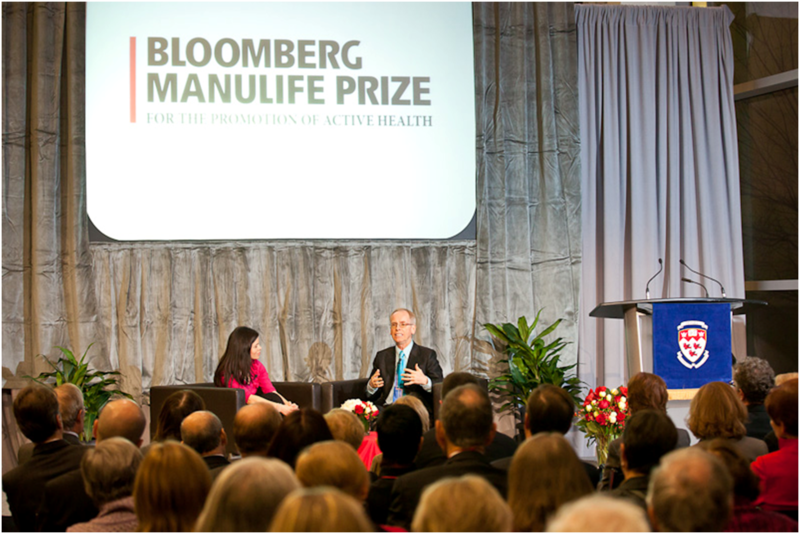 I accepted the Bloomberg Manulife Prize for the collective work accomplished by an amazing group of colleagues, collaborators, students, and funders over the past 30 years. This is the largest prize in the physical activity field, and it recognizes not only excellence in research, but also the use of research to promote active lifestyles. This is the second year of the prize, administered by McGill University. 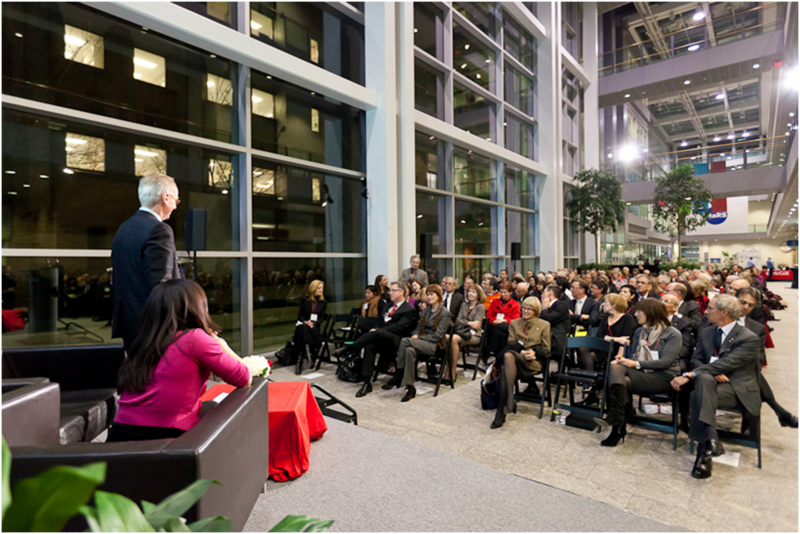 The prize was given at a public event in Toronto attended by Lawrence Bloomberg and the CEO of the Manulife Insurance Company. Mr. Bloomberg is a dedicated exerciser and marathoner who wants to recognize people who contribute to the physical activity field. The inaugural winner was my good friend, Steve Blair. It is certainly fitting that an insurance company would co-sponsor this prize. 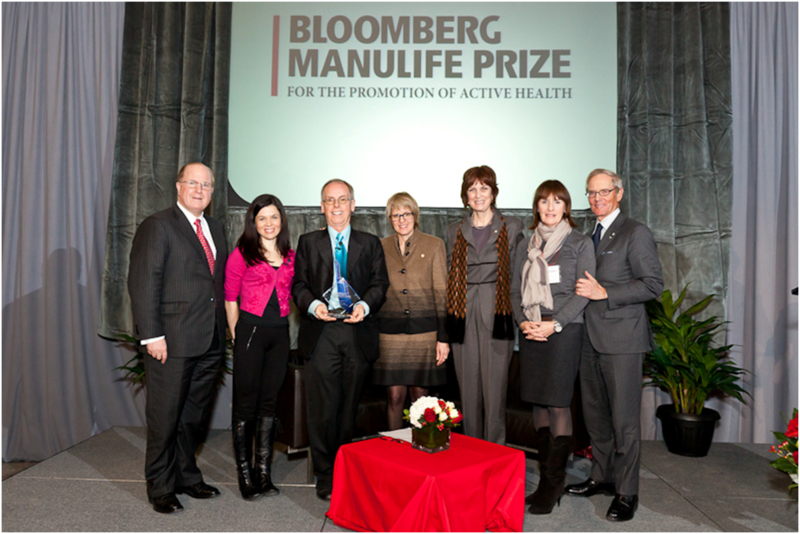 Mr. Bloomberg is committed to using the prize to create a higher profile for physical activity in the media. I think this goal was accomplished because I was featured in a full-page newspaper ad, interviewed by 3 newspapers, 2 TV stations, and a radio station. I provided a voice-over for a 30-second commercial that will be played for one month on a national TV network and at a major movie theatre chain. I participated in public forums in Toronto and Montreal, and I presented to staff from multiple agencies organized by the Department of Public Health in Toronto. During my moment in the public eye in Canada, I tried to emphasize the importance of creating more activity-friendly environments. There was a lot of receptivity to this message, because it is a current issue. The mayor of Toronto has removed bicycle paths from a major street, though in Montreal a $150 million fund for more bicycle and pedestrian facilities was announced. I met a group which is trying to preserve open space in Montreal as a public park instead of having it developed. Throughout my visit I was very aware of how many people over the years have contributed to the body of work that is changing perceptions, and hopefully behavior and policy, about activity-promoting environments around the world. The $50,000 prize will be used to advance our research. 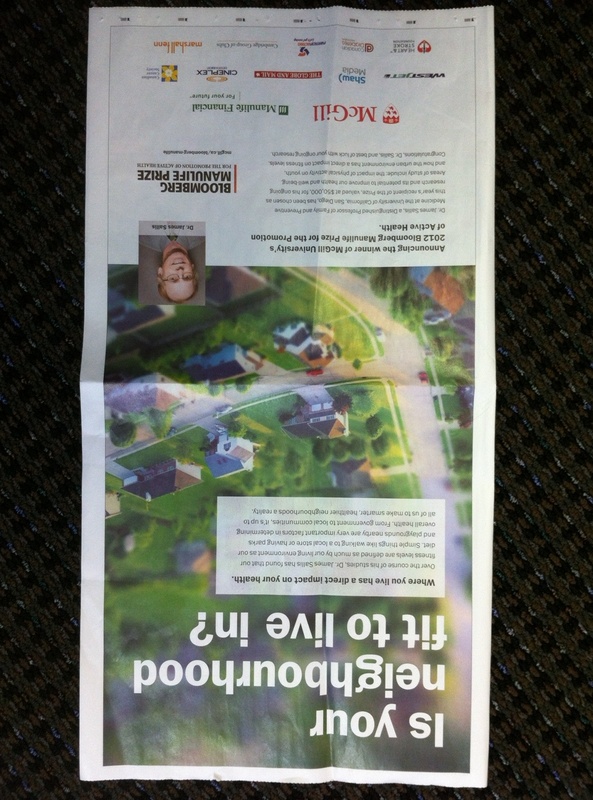 Montreal Gazette (print and online), January 21: HOW FIT IS YOUR NEIGHBOURHOOD? By drjamessallis in Uncategorized on January 28, 2013 .